13 February 2014. Computer scientists and bio-engineers at Harvard University created a system inspired by termites that controls the work of autonomous robots in complex construction tasks. The team led by computer scientist Radhika Nagpal published its findings in the new issue of the journal Science (paid subscription required), and will also be presented at this week’s meeting of the American Association for the Advancement of Science. Nagpal, with Harvard colleagues Justin Werfel and Kirstin Petersen, are building a social and technical system they call Termes for autonomous robots to collaborate on complex projects with minimal supervision. Systems with these characteristics say the authors could be deployed for building in environments considered too dangerous or remote for humans. Termites use an implicit form of communication known as stigmergy, where they observe each changes to the environment made by other termites in the colony and adjust their actions based on those observations. 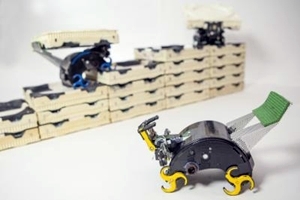 Nagpal and colleagues devised a proof-of-concept system with small, simple, autonomous robots building a pre-designed structure with blocks. The core of the system is algorithms that read sensing data from the robots’ environment and work collaboratively to build the structure. In the publication, the robot devices build a structure with four simple sensors and two actuators. The robots are able to climb the structure, and carry and attach the blocks with minimal controller overhead. The following video demonstrates the Termes robots at work.